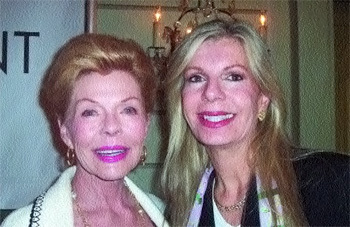 with Spirit of Achievement Honoree, Princess Yasmin Aga Khan. Award-winning actress Sharon Stone was among a group of distinguished women honored for their extraordinary achievements in fields ranging from health care activism to child advocacy to journalism and philanthropy, at the 53rd Annual Spirit of Achievement Luncheon, sponsor ed by the National Women’s Division of the Albert Einstein College of Medicine. The event took place on Thursday, April 26, 2007, from 11:45 a.m. to 2:00p.m., at The Pierre Hotel in Manhattan, and raised money in support of clinical research focusing on autism and other serious developmental disorders in children. * Lois Pope, a noted philanthropist and founder of the Lois Pope LIFE Foundation, specializing in neurological research, who received the Lizette H. Sarnoff Award for Volunteer Service. Felicia Taylor, a five-time Emmy Award nominee, freelance journalist and former anchor for NBC News, served as mistress of ceremonies. According to Bambi Felberbaum, president of Einstein’s National Women’s Division, proceeds from the luncheon will be used to help establish a clinical r esearch program at Einstein’s Childr en’s Evaluation and Rehabilitation Center, one of the nation’s leading centers serving children with a severe neurodevelopmental problems including autism and autistic spectrum disorders, mental retardation, cerebral palsy, spina bifida, hearing loss and language and learning disabilities, among others. Established in 1955, the Albert Einstein College of Medicine of Yeshiva University is one of the premier centers for biomedical research and education in the United States. A pioneer in the practice of socially conscious medicine, The College has earned “Center of Excellence” status from the National Institutes of Health in six major biomedical fields: brain, cancer, diabetes, AIDS, liver disease and sicklecell disease. Einstein is one of the nation’s most selective medical schools. Since 1953, the National Women’s Division, a major volunteer fundraising arm of the College, has raised over $110 million in support of research and education programs at Einstein. The annual Spirit of Achievement Luncheon is their flagship fundraising event.